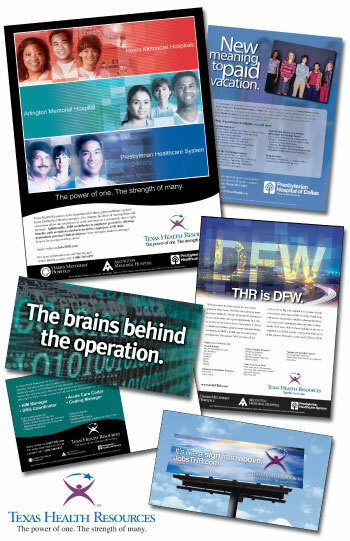 Texas Health Resources (THR) is comprised of three separate healthcare systems: Harris Methodist, Arlington Memorial and Presbyterian. The campaign was designed to educate the talent pool as to who THR was. Ads were designed that prominently featured the individual systems as part of the greater whole. Educating them about the THR structure, the message was simple: The power of one. The strength of many. This campaign was responsible for winning this healthcare giants contract valued at an estimated $1.5 million annually.